Well-connected by air, railways and roads, chances are you have put your base in Split for your time in Croatia. It is also likely that, after you’ve spent a few hours there, sailing seems an obligatory activity. All week-long trips are booked? No worries! You’ll always find something for a shorter turnover. Go and discover the rest of the area one sailing day at a time. Want to check coastal towns and islands in one day? Go for a sailing trip to Trogir. From Split, choose to go all along the shore: it is a slower way, but then you get to see another charming town: Solin. It has an extensive collection of Roman ruins, from the times it was part of the Eastern Roman Empire. For modern day visitors, it is also great for a picnic! Then, hop back aboard and head to Trogir. Its port can be busy all year long, but once you anchored, you’ll forget about the crowd. With the magnificent reminiscences from gothic and renaissance times, Trogir is more like an open-air museum than a residential area. The touristic highlight is Radovan’s portal but the town market is just as impressive. While getting to Trogir was your primary purpose, you can even stay on the island a little more to see more of the sights. Cross the bridge to Ciovo: for the best view, go straight to the western side. From there, you can also go for a walk towards the inner parts, for a mountain view and mind-calming quietness at the Church of St. Theodore. Sailing on the Adriatic coast means clear and warm sea all over, so you can stop for a swim or snorkel whenever you want. In case you fancy to go a little deeper, there are great diving locations, too. Brac island, for example, is about 2 hours away from Split making it a good choice for a diving trip. A unique location on the island is Lucice Bay, its underwater cave being a treasure trove for a submersion fanatic. Milna is a popular nearby port, with two top-notch marinas, where you can anchor your boat, and switch to flippers. Just a stone’s throw from Ciovo or Brac and still quite an overlooked sight, Solta can be an excellent destination for your day trip from Split. After a brief sailing of 9 nautical miles to the port of Rogac, you’re there to adore the old villages of Solta. In the oldest village, Somorska, you can marvel at the ship-building traditions of the region, or you can find your alone-time at one of the many quiet bays of Maslinica, the village of the fishermen. Sea caves are particular sights on the Adriatic, so even you don’t want to miss them. Especially if you are this close to the two most famous ones, as starting out from Split. 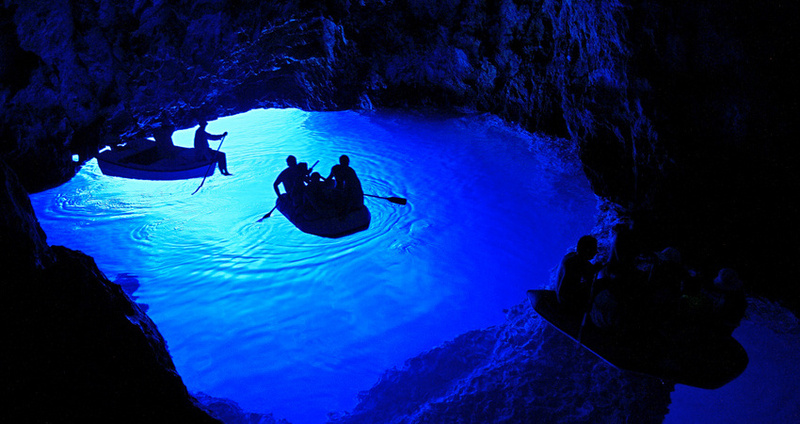 Bisevo island is home to the Blue Cave, or Modra Spilja, that has to be visited at a special time of the day, between 11am and noon, to enjoy its glowing blue beauty. Anchoring in Mezuport bay is the most convenient, from there, you must take an official boat of the local authorities to access the cave. Be aware that the waiting times can be as long as a few hours to get to a boat! Or you can try the a sea cave of another color: the Green Cave or Zelena Spilja is on Ravnik island, a small islet close to the eastern shores of Vis. Anchoring is possible in Rukavac or Budicavac Veli, and you can either take your dinghy to go in, or just swim in. The cave is painted green by the light of the early afternoon sun, peeking in from a hole on the top of the cave and reflected from the bottom.